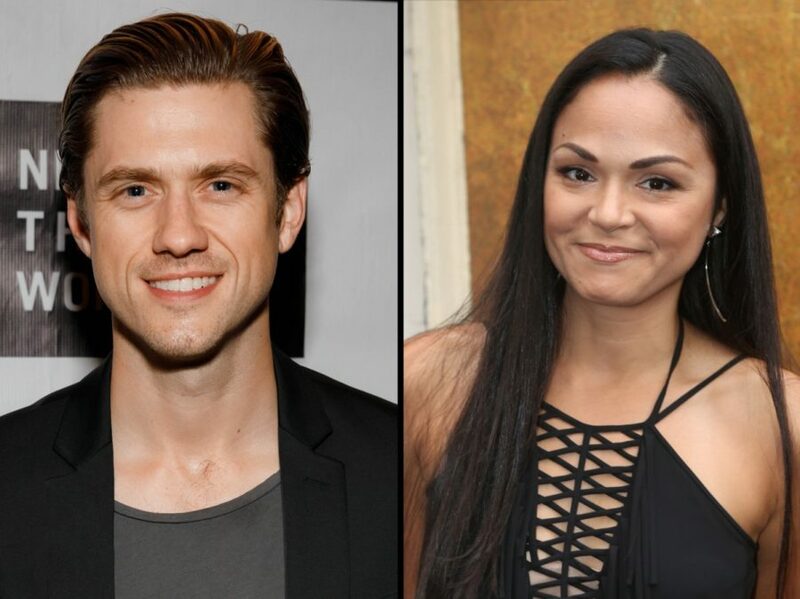 Stage favorite Aaron Tveit and Tony winner Karen Olivo are stepping into the shoes of Ewan McGregor and Nicole Kidman for the pre-Broadway run of Moulin Rouge! The Musical. Tveit will play Christian and Olivo will portray Satine in the highly anticipated stage adaptation of Baz Luhrmann's 2001 motion picture. As previously announced, the show's out-of-town engagement will reopen Boston's newly restored Emerson Colonial Theatre beginning on June 27 for a run through August 5. Moulin Rouge! The Musical features a book by John Logan, direction by Alex Timbers, choreography by Sonya Tayeh and music supervision, orchestrations and arrangements by Justin Levine. Tveit and Olivo, who led a 2017 workshop of the show, will be joined by a starry company that includes six-time Tony nominee Danny Burstein in the role of Harold Zidler. "There are so many people involved in this production of Moulin Rouge—Alex Timbers, John Logan! Sonya! Justin Levine!—who I have been such a fan of for so long!" shared Tveit in an exclusive statement. "And that we all get to jump headfirst into this vivid world Baz created onscreen, next to Karen and the rest of this amazing company? This is a special thing. And hopefully fans of this great story will be excited to revisit this after some time away!" "Moulin Rouge is one of my favorite movie musicals and I am a true fan of the world that Baz so brilliantly brought to the screen," said Olivo. "To be able to reimagine this iconic piece for the stage with Alex Timbers at the helm is a dream…not to mention, who doesn’t want to sing opposite Aaron Tveit? The talent that has been assembled for this production is unreal and I can't wait for the world to be introduced to the Moulin Rouge family." Tveit most recently appeared onstage as Bobby in a 2017 mounting of Company at Barrington Stage. His Broadway credits include Hairspray, Wicked, Next to Normal and Catch Me If You Can. He has been seen on-screen in Grease: Live, Les Misérables and Graceland. Olivo is a Tony winner for West Side Story who has also been seen on Broadway in Rent, Brooklyn and In the Heights. She was recently seen in the Chicago production of Hamilton and is slated to lead a mounting of Fun Home with Madison, Wisconsin's Forward Theater Company. Burstein earned Tony nominations for Fiddler on the Roof, Cabaret, Follies, Golden Boy, South Pacific and The Drowsy Chaperone. Joining Tveit, Olivo and Burstein in the cast will be a talented slate of Broadway veterans including Tony nominee Sahr Ngaujah (Fela! ), Tam Mutu (Doctor Zhivago), Ricky Rojas (Burn the Floor) and Robyn Hurder (Chicago). Set in the Montmartre Quarter of Paris at the turn of the century, Moulin Rouge! The Musical follows an ambitious, lovesick writer, Christian (Tveit), and a dazzling, entrancing chanteuse, Satine (Olivo). Their lives collide at the Moulin Rouge with its many characters including the host of the Moulin Rouge, Harold Zidler (Burstein); the brilliant, starving artist Toulouse-Lautrec (Ngaujah); the greatest tango dancer—and gigolo—in all of Paris, Santiago (Rojas); the tempting Nini (Hurder); and The Duke of Monroth (Mutu), the wealthy and entitled patron of the club who thinks he can buy anything he wants, including love. As was the case in the movie, the stage musical's score will feature some of the most beloved popular music of the past 50 years. The creative team for Moulin Rouge! The Musical includes scenic designer Derek McLane, costume designer Catherine Zuber, lighting designer Justin Townsend and sound designer Peter Hylenski. Details on the Broadway run of Moulin Rouge! The Musical will be announced at a later time.